Investigators in Texas are trying to find out what caused a huge explosion at an oil refinery that killed at least 14 people and injured more than 100. Britain's BP, owner of the Texas City plant, said terrorism was not thought to be responsible for the blast, which shook buildings five miles (8km) away. Sections of the plant were reduced to cinders and rubble in the explosion on Wednesday, which sparked a big fire. 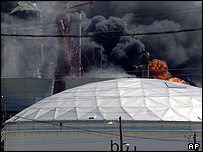 The refinery, the third-biggest in the US, has had previous safety problems. In March last year, it was evacuated after an explosion that cost the company $63,000 in fines. Last September, two workers died and another was seriously injured when they were scalded by superheated water that escaped from a high-pressure pipe. Wednesday's explosion happened at 1330 (1930 GMT) at the western end of the plant, which covers an area of almost 500 hectares. BP said the blast happened in an isomerisation unit, used to produce octane for petrol. It had been working normally before the explosion, company officials said. Employee Charles Gregory said he felt the floor rumbling as the blast erupted. "It was real scary," he told the Associated Press news agency. "Have you ever heard the thunder real loud? It was like 10 times that." Thick clouds of black smoke rose into the air as firefighters struggled to douse the flames. 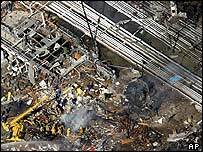 The aftermath of the blast left a gaping hole in the earth, while chunks of charred metal littered the ground. Cars parked nearby were coated with a layer of ash. "We believe 14 people lost their lives as a result of the fire," site director Don Parus said. "It's a sad day for BP." The Texas City refinery, 35 miles (55km) south-east of Houston, is the third biggest in the US, employing 2,000 people. It processes roughly 450,000 barrels of crude oil each day, amounting to about 3% of domestic oil supply in the US and one-third of BP's output across the country. BP spokesman Bill Stephens said investigators had started looking into the cause of the explosion. "We're going to be very thorough on this one," he said. "I can't tell you exactly when we will finish this investigation, but no stone will go unturned." Another company spokesman, Hugh Depland, virtually ruled out terrorism as a factor, saying: "We have no reason to believe this was anything caused by an outside agent." Health officials said more than 70 of those injured had been working inside the refinery and some of them were in a critical condition. Texas City resident Mike Martin described "a real loud explosion, like a sonic boom". "It shook the pictures bad enough to where it knocked them off the wall. And it frightened me, so I jumped out of bed." Judith Mantell, 62, told the Houston Chronicle the blast lifted her vehicle off the ground at her home five miles (8km) away. "I've never seen flames that high from anything. They were bright orange, with yellow on the side," she said. Texas City was the scene of the country's worst industrial accident in April 1947, when a ship full of ammonium nitrate, used in fertiliser, exploded in the harbour, killing at least 576 people. I have family in Texas City, we have been in contact with them throughout the day. They told us there was a huge explosion that vibrated through the air and ground knocking the pictures off the walls and breaking some of the windows in their neighbourhood. They stated that they were initially advised to remain indoors but this was soon lifted and as most of the injured were people living in the town there is a sense of loss throughout the town.